The Space Foundation keeps our followers up to date through the popular social networking site, Twitter. We post late-breaking news, reminders, and items of interest on a regular basis – and from time to time we solicit our followers’ opinions or input. If you want to follow us on Twitter, it’s really simple: go to http://twitter.com/SpaceFoundation. 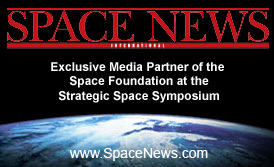 If you already have your own Twitter account, sign on and then add SpaceFoundation to the list of entities you follow. Make sure to type SpaceFoundation as ONE WORD rather than two. If you don’t have a Twitter account, you can open one (it’s free!) and sign up to follow SpaceFoundation. Or, you can simply search for SpaceFoundation – or any other topic you are interested in – by typing the search phrase into the box on the opening page. Once again, you’ll get better results if you type SpaceFoundation as ONE WORD. To help you keep track of Strategic Space Symposium activities, just search for #strat09 – that will deliver all posted tweets on the symposium.